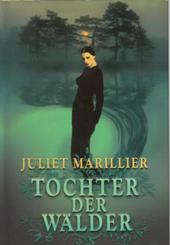 I am happy to announce that finally the interview with the lovely author Juliet Marillier is uploaded. You’ll find this all-lenght-interview while pushing „weiterlesen„. Please note that the interview was done at the end of last year already. This you’ve to keep in mind when reading some of Juliets answers. You have a strong fanbase in Germany, I can tell you. So, let’s start with this: Do you plan to visit Germany for maybe promoting your novels – or just for fun? 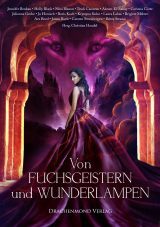 Your more adult novels were big successes here, however both “Wildwood Dancing” and it’s sequel didn’t come out in German translation yet. Do you know if they’ll be published in this country some time soon? The rights to “Wildwood Dancing” have been bought by Heyne, but I haven’t been given a publication date yet. 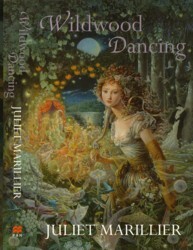 What do you think are the main differences between your more grown-up books and “Wildwood Dancing”. Was it a different writing experience? Initially I did try to write a book that was markedly different in approach – I was aiming for a ‘fun’ story, something to divert and entertain. It turned out my publisher wanted a far darker and more psychologically complex story than the one I wrote at first, so I made substantial changes and after a lot of soul-searching and hard work I am convinced the final version is much better. I had to restrict myself to a shorter word count for these young adult books, which was good discipline for me. I also needed to focus very much on the personal journey to maturity of the main protagonist. That’s essential in young adult fiction – the reader should see the protagonist grow and learn in some way during the story. Actually I believe all my books are essentially about people meeting challenges, growing stronger and acquiring wisdom. At the moment you’re working on a further “Sevenwaters” novel. I am aware that you cannot give to much away, but maybe you could tell us why you decided to revisit this familiar setting again? And how does it feel to write another “Sevenwaters”-novel? The reasons were practical rather than artistic. I had intended to write a fourth book in the Bridei Chronicles next after the two young adult books. The Bridei books have done less well in the USA than my earlier books, so I was persuaded to return to something closer to that original series for the US market. Up until then I’d had no intentions of writing any more Sevenwaters novels, despite a lot of pressure from readers. I started the project with rather mixed feelings, but because “Heir to Sevenwaters” is a stand-alone book, with the same setting and some of the same characters but an entirely new story, I got swept up in the writing very quickly and I’ve thoroughly enjoyed doing it. 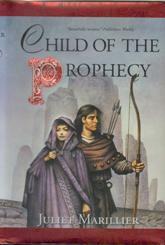 In “Child of Prophecy” we met Sibeal, a character I really liked – will she be part of the new book? Yes, Sibeal has a significant part in this story. Of all the sisters, she gets the next biggest role after Clodagh, who is the narrator and central character. Let’s stay a little bit on the “Sevenwaters”-novels. 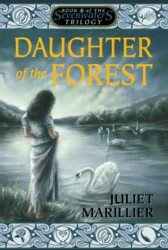 While writing “Daughter of the Forest”: Did you know then that it would become a series of books? Not at first. There was a certain point I reached in the story where I decided I wanted to explore the impact of the swan transformation on later generations of the family. I then made some changes so the groundwork for the trilogy was there. You state in your FAQ: “Note again: We know very little about Sorcha’s mother – an untold story there”. You know how to make one curious! Will you share with us this story one day? I don’t think so, but then, I always said I wouldn’t write another Sevenwaters book and now I’ve done it, so I guess anything is possible! 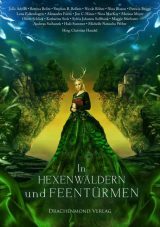 Although there will be another Bridei-novel and although there’s “Heir to Sevenwaters” coming out – both this series started as trilogies first. What do you think is the reason that so much fantasy writers love telling their stories as a trilogy? These times really big fantasy series with multiple volumes and large casts of characters seem to be very “in”, as for example “A Song of Ice and Fire” or “The Wheel of Time”. This differs a lot from what you’ve written so far. But would writing such a giant-sized series an option for you? I don’t feel drawn to writing such a lengthy series. I think that’s because fantasy world-building is less important in my work than human drama and character development. Also, I like variety. Your first books were written in first person view. After that you changed that technique. Do you love trying new styles or was it just something the story demanded? I use first or third person according to what feels right for the story. First person was good for the Sevenwaters series because those were novels focussed very closely on the personal journey of one particular character. With the broader scope and larger cast of characters in the two Viking books and the Bridei Chronicles I really needed to use third person – that allowed me a balance between male and female viewpoints and let me visit battles and voyages as well as the more domestic scenes. Because the books are set in real history, I can’t move beyond what is plausible. My characters are restricted in what they can do by their time and culture, so battle scenes are generally out for women. I’m back in first person for Heir to Sevenwaters. When I use third person, I restrict my ‘point of view’ characters to a very small number. Usually most of the story is from the POV of either the principal male or the principal female character, with only a few key scenes from other points of view. For instance, in Wolfskin, Somerled does not get the POV except in the very last little scene. I chose to show him mainly through Eyvind’s eyes, and I think that worked better. Not so long ago J. K. Rowling announced that her fictional character Dumbledore is gay, causing a big discussion. Are there any chances to see a gay or lesbian character in one of your upcoming novels? 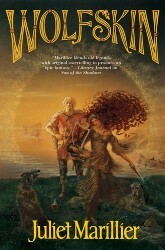 There is a gay character in “Heir to Sevenwaters”. And no, I didn’t do this because of Dumbledore – I had already written it before J K Rowling made her big announcement. Do you think an author has responsibilities for his/her work? Can novels change something within the reader? I do believe an author has responsibilities, especially an author who writes for younger readers with perhaps less capacity to filter fictional stories through real life experience. As a reader, I very much dislike novels that end without hope. I don’t mind sad endings, but I need to finish a book understanding that at least one character has learned something positive, or that there is some small note of hope or redemption even in the darkest situation. Yes, I believe novels can change something within the reader – a story is a powerful tool for touching the deep and hidden parts of the psyche and making us recognise our strengths and flaws. A story can illuminate our pathway and make us feel differently about people and situations in our lives. I believe that authors have the same responsibility as traditional storytellers had in times past – to do our best to make sense of life and its challenges. And also to entertain, of course! Did you always write Fantasy or did you try another genre as well? I occasionally write short fiction which can be fantasy, romance or something based on my life experience. I did not set out to write fantasy with my first novel, Daughter of the Forest – at that stage I didn’t read any fantasy and didn’t really understand genres anyway. I just wrote the story I wanted to write, based on my love of fairy tales and my preference for a character-driven drama. Publishers and booksellers then put it into the fantasy category. I may try writing a novel in another genre some day, but fantasy seems to come naturally to me. So why Fantasy? What is your personal opinion – what makes this genre so attractive to some readers (and writers as well)? I can only speak for myself, not for other writers. As I mentioned, I didn’t set out to write fantasy, but to write the kind of stories I would love to read. It just happened that I was fond of history and folklore, so my stories ended up full of both. I really view my books as historical fiction with a magical element. I love the fact that fantasy writers are, in their way, part of an unbroken chain of traditional storytellers, using the magical and uncanny to illustrate and make sense of real life problems and challenges. What makes fantasy so attractive to readers? Well, I think there are two main types of fantasy readers. One type loves the world building aspect of fantasy stories. This reader is more interested in the settings and systems of the story’s world than in plot or character development. He or she is a devotee of those long series with intricately devised worlds, and is the type of person who loves to roleplay or write fan fiction set in the world of the books. The other kind of fantasy reader is a person who may read a lot more widely and will enjoy fantasy books that are ‘outside the box’, books that stretch the limits of the genre, such as the work of Susanna Clarke or China Miéville . The appeal of fantasy to this reader may be that it opens up new parts of the imagination. There’s also the fact that fantasy writers are unafraid to deal with big, life-changing themes and issues. How do you think the fantasy genre did change within the last years. And do you think there’s a trend? I have the feeling that Australian female authors did really emerge on the market within the last years. There’s currently a group of six or seven Australian female authors who are well known internationally for their fantasy, whereas ten years ago the only big name from Australia was Sara Douglass. There are some highly successful male authors from here too, such as Garth Nix and Sean Williams. In general, I think there is some very innovative fantasy being written these days. The range has become so wide that it’s no longer really appropriate to classify all fantasy books in one genre any more. There’s also, still, a great deal of rather derivative stuff being published and it seems to run in trends – it will be vampires for a year or two, then something else will take its place. The market is somewhat driven by these fashions, especially in America. Does your publisher ask or even demand that you make rapid changes on your books? I usually get a month to work on my editor’s report. Of course, I may have to juggle that work with all sorts of other commitments. For instance, I am submitting “Heir to Sevenwaters” on December 1. I’ll get the manuscript back in early January with an editorial report that combines comments from three editors, in Australia, the USA and the UK. I’ll have until the end of January to revise the book. I will do some of the things they suggest, and in some places I will find a compromise that achieves the result they want. Sometimes I don’t want to make suggested changes, so I justify leaving things the way they are. While working on the editorial report for “Heir to Sevenwaters” I will be continuing to write “Heart’s Blood” and checking the proofs for the American edition of “Cybele’s Secret”, which has not yet been released over there. I can’t remember any time when I’ve had to make changes at unreasonable speed, though with the two young adult books, the US editor (someone I hadn’t worked with before) wanted three rounds of changes. I’d never been asked for more than one round before. Thanks to “The Lord of the Rings” and “Harry Potter” now a lot of successful books are being made into movies or are optioned for TV. 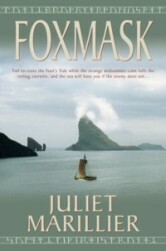 Any chance for a Juliet Marillier-novel hitting the big screen some time soon? Would you like that idea or rather not? It depends. My agent has had a couple of expressions of interest in stage and film rights to Sevenwaters, but nothing very serious thus far. I would be happy to see a film made if I had faith in the people who were doing it. But it would be very difficult for me to relinquish artistic control. I would absolutely hate to see a bad film of one of my books, with plot changes I didn’t like and casting I thought was wrong. Generally, authors get very little say in these matters unless the film is so likely to generate megabucks (as with the Harry Potters) that the author can more or less make her own terms. Can you remember what your first story (or novel) was about? Yes, I still have it – written at the age of 7. It was about robots going crazy and destroying a town, until a boy works out a cunning plan to disable them. It was full of death and destruction. Tell us the truth: Did you ever write fanfiction? And what is your opinion about fanfiction? I’ve never written fan fiction and I’ve never wanted to. I have more than enough ideas of my own without needing to use other people’s. My opinion of fan fiction? I find it odd that people want to write it, but I suppose if people really love the ‘world’ of a book they may want to go on creating characters and events for that world outside the scope of the original work. I don’t read fan fiction based on my own books. I am uncomfortable with the idea of people using my characters in their fan fiction. On the other hand, it is flattering to an author when people love the books enough to want to write their own stories based on them. One of the best aspects of being a published writer is to be able to inspire other writers. But I prefer to hear that my books have encouraged aspiring writers to make progress with their own original work, not fan fiction. I have heard some people say that writing fan fiction is good preparation for writing one’s own fiction – if that’s true, I guess it’s a good thing! On your website you’re telling us you’ll write a gothic fantasy called “Heart’s Gold”. Any chance to tell us more about this project? It’s set in another timeframe, if I understood you correctly. Why is that? ”Heart’s Blood” is the title. I have developed a taste for darker fantasy recently (probably since I featured vampire-like characters in “Wildwood Dancing”) and thought I’d like to try a Gothic-flavoured novel. This book was originally intended to come out before “Heir to Sevenwaters” but my new US editor decided she wanted the Sevenwaters book first. So I am jumping around a bit with various series. “Heart’s Blood” is definitely a stand-alone and is set in a later period, Ireland post-Norman invasion, because that suits the circumstances of the central characters better. The supernatural element in this book is more ghostly than mythical, though in fact there’s a little of both. Any other fairy tale or myth you’d love to explore within a future novel? There are several I would consider exploring in the future, including Beauty and the Beast, The Goose Girl and Vasilissa the Wise (I love Baba Yaga!). There are also some wonderful stories from Asia. “Heart’s Blood” is very loosely based on a well known fairy tale. Thank you so much for your time and for being so kind to answer these questions! Maybe we can do this again at some point in the future. All the best for your upcoming novels and both for your working and your private life!